When it comes to best skateboard wheels, the word “best” can have a different meaning. Since the wheels have to be suitable for what type of skateboards, the purpose, and the skill level of the skateboarder. Therefore, the correct interpretation here is what type of wheels is most fit for you and the style you are skating. Don’t worry though, this guide will help you to understand and pick the type of wheels that match for you. Also, I have a list of top wheel brand for your reference too. So don’t miss out this opportunity to gear up your skateboard! 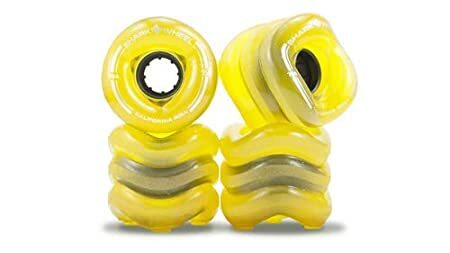 Why are Skateboard Wheels Made of Polyurethane? 1. What wheels are best for street skateboarding? 2. What does 78a mean on skateboard wheels? 3. 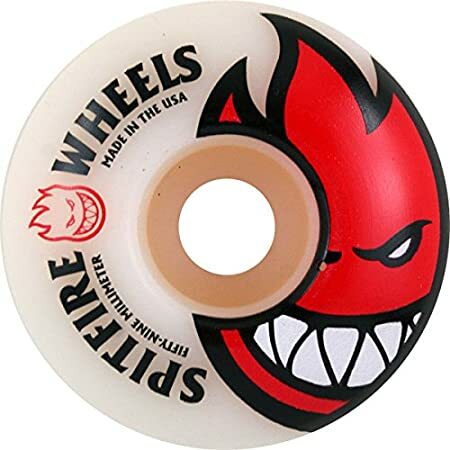 Are Spitfire wheels good for street skating? 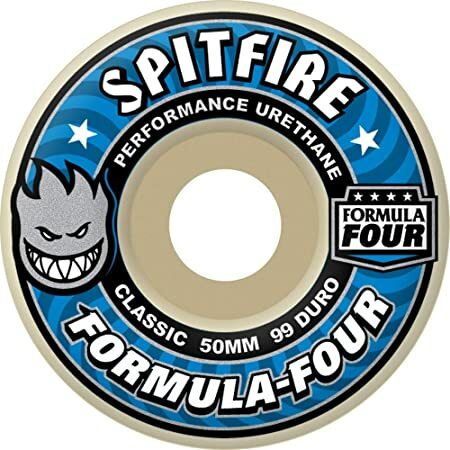 Let’s get started with the Spitfire brand first as the best wheel in my personal experience! This bighead version has gained lots of love due to the efficiency on smooth surfaces. Please take notice that the durometer is 99a which is one of the hardest wheels out there. You don’t have to worry as Spitfire is the top quality brand. 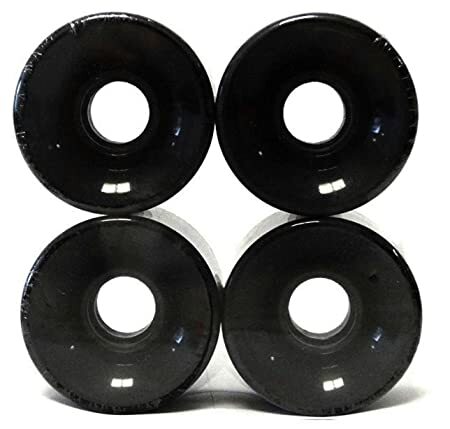 They are likely the best skateboard wheels for tricks for the professional picks as it rolls smoothly on the park, pools, and ramps. This is optimal for professional competition or showing off your complex tricks. The speed is amazing when you combine with the right diameter. Depending on your skateboard type, you should pick the right diameter accordingly. This available in 6 colors: red, yellow, blue, green, purple, and royal blue. Similar to the above, these are the classic series for those who don’t like the brand iconic design. The durometer is still 99a, so it is preferable a pro pick to skate on the ramp, park, and pool. Though this doesn’t have the cool big head design, the spinning patterns show union between the wheels. So it helps to make your deck, even more, stand out instead. Please note one thing that the diameter scales with your color selection! So the red color has 51mm, green is 52mm, yellow is 53mm, and so on. The wheels are 100% from the USA to ensure the best quality for your needs. If you manage to receive a defect, the brand has an excellent warranty service to compensate you. Ricta is another option for the best soft skateboard wheels. If you also enjoy cruising and traveling on a skateboard, this is definitely fit for your needs. These wheels are both great for beginner and professional skateboarders. These wheels will arrive in a set of four for the price between $30-$55. They are made of soft urethane, yet has a very solid construction. The primary purpose is to combat rough and edgy surfaces such as streets, hills, and rolling over cracks. They provide a pleasant experience to cruising with the 52mm diameter wheels. This is a well-balanced size between speed and acceleration. You have total control over how fast you want to go. 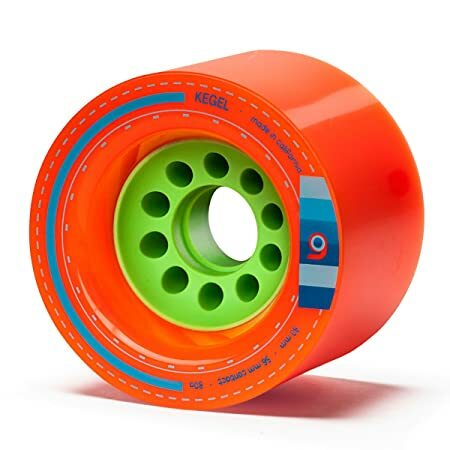 If you prefer wheels with colorful design instead of class, this one is definitely the best skateboard wheels for concrete parks. These wheels are different from those previously since it has a durometer of 101a. Don’t worry though, it also an anti-stick slide in case you run over something slippery. The main material is still Urethane as the previous wheel. This is to ensure the maximum shock absorption and can withstand heavy impacts. As for Mini-Logo, this series is all about simplicity and maximum performance. The durometer is even harder with the 101A size. Although these wheels are very hard, with the super high rebound formula, these wheels can help you secured a risky landing at ease. These wheels have two types of cuts: the A-cut is mainly for the street skater, which has a diameter of 50mm – 56mm. This is the standard size for tricks or park skating. While the C-cut is for transition skater who is moving up the ranks to become professional. The C-cut is between the size of 55mm – 60mm, which is for skating on the ramp, pool and smooth surfaces. This is why there are two links for you to compare. Due to the simplicity, you can have this set of 4 wheels really cheap, around $14-$16. Pig is also a renowned brand out there for many professional challenges. The quality is about built to last over many usages. This is also one of the top pick from the professional due to its high performance in any competitions. The wheels have 101A durometer, which is ultra tough against heavy impact. It also absorbs shocks reliably which makes it ideal for air tricks, flips, shredding, and sliding. Though this won’t give you top speed, it balances between top speed and slow acceleration with the 52mm diameter. This would suitable for most type of decks and bearings in the market as a standardized size. For the price, it is quite reasonable at $31 dollars for the whole set of four. 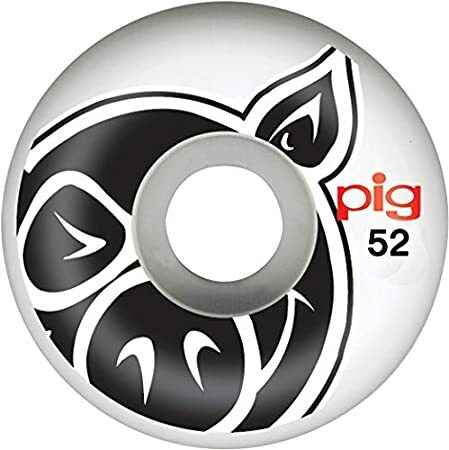 The design has an iconic pig head and the number indicating the wheel size. 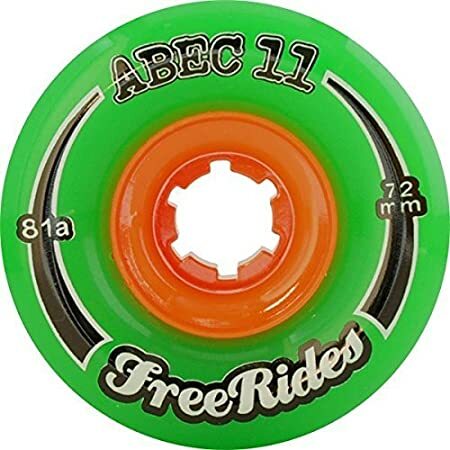 Unlike other brands, ABEC 11 is a brand that focuses on speed and high performance. From that, it becomes unique when gearing on a cruiser or longboard. The Freerides series is one of the best skateboard wheels for cruising. You can see here the durometer is just about 81a, this is ideal for your cruising experiences over any streets, roads, and hills. It is tough enough to absorb small impacts each time you roll over cracks and pebbles. While it is still soft so you can have some amazing bounces and smooth landings. This is also big wheels with 72mm in diameter. So you should keep in mind that they belong to the cruiser and longboard trucks and bearings. Penny Wheels are one of the best skateboard wheels for cruising. The brand’s wheels are also optimized to give you the best cruising experience here. For the clear color, they are affordable for $25 in a set of four. With 78a durometer, this gives your lots of bounces as the wheels are soft. Though make sure these wheels are strictly for cruiser deck and longboard. As the huge diameter of 59mm, these wheels pretty fit for daily traveling or even racing against your friends. Since they are big wheels, so it would take some efforts first to accelerate them before reaching the top speed. When reaching top speed though, rarely others can match with you. So keep in mind to control your skateboard speed. Inefficient on sleek park street, ramps, and pool. With 85a durometer, this is one of the best skateboard wheels for rough roads. They are actually well-balanced between the scale of softness and hardness. Very ideal for most surfaces whether you skate in a park, on the streets, hills or rough roads. Though the diameter is 60mm, which quite reserved for cruising and sliding only. These are both beginner and professionally friendly. These wheels can definitely reach top speed and go very fast downhill, so watch out! Unlike the previous brands, Shark Wheels have an interesting design with a curved shape. Don’t underestimate though, this unique design is the best skateboard wheels for the street that can even conquer most situations. The diameter of 60mm is obviously optimized for cruising speed. The design construction also supports you with better slide control and grip very well. Don’t worry and try to test it out in several locations. The middle range 78a durometer is just so right for most surfaces. Thanks to their special sidewinder formula. This combines both the friction reduction and more traction when riding. So you can go very fast on the sleek surfaces, yet feels comfortable when rolling on the rough surfaces. Orangatang offers a competitive feature to its wheel with a large supportive core. This Kegel version is smoother than other normal wheels. This is one of the best skateboard wheels for rough roads that you should have in stock. With the supportive core 46mm, you can enjoy your cruising on many surfaces. It provides more weight support, especially rolling over rocks and cracks, while you can maximize acceleration. The durometer is 80a, the perfect softness for bounces and nice landings. The diameter is also 80mm, makes it one hell of a big wheel here, you might consider a riser pad for these to avoid wheel bites. Otherwise, with this size, it can conquer most of the rough roads out there. 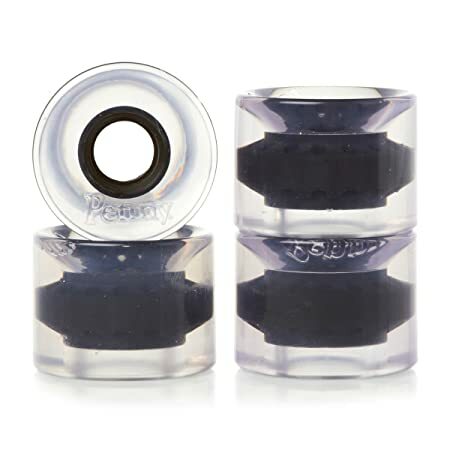 There is a cheaper version with encapsulated core and 75mm diameter. Santa Cruz is also a renowned brand due to his long history in the market. It also provides lots of reliable skateboards and accessories. 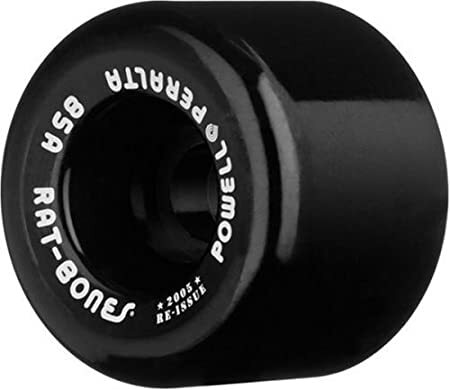 People also see this brand has the best skateboard wheels for the street. Though the price would be around $35 since these are high-quality wheels. If you prefer some old school design, consider to check out this one! They have a sick design of Slime Ball Vomits which look very cool when you roll around the street. The paints are highly detailed artwork and they won’t wear off easily. As for the size construction, these are rather big wheels mainly for cruising and sliding at 60mm diameter. The 97a durometer can last for a long time. They are extremely hard and can go very fast on a ramp or pool. This is mainly your money worth for. These wheels are definitely great on sleek surfaces to make them great for professionals too. Cool looking design with highly detail artworks. If you are just starting to skate and have a tight budget, Everland might be a suitable choice for you. Since the wheels set only cost about $13 bucks. Of course, it won’t have any special features and top quality materials. The wheels look nice and have many color option for you to select. The wheel is quite big with a 65mm diameter, but it should provide a decent speed for your cruising experience. As for the 78a durometer, these wheels are soft to roll on the streets and hills. This makes it ideal if you usually travel to school or work nearby. They won’t give top speed yet enough to not getting late. Here is what you need if you prefer plain and simple wheels. From Pro Skateboard, the brand offers an affordable solution for beginners to have their wheels ready for practice. The starting price is $11 buck, pretty neat to save money for a cool deck instead. 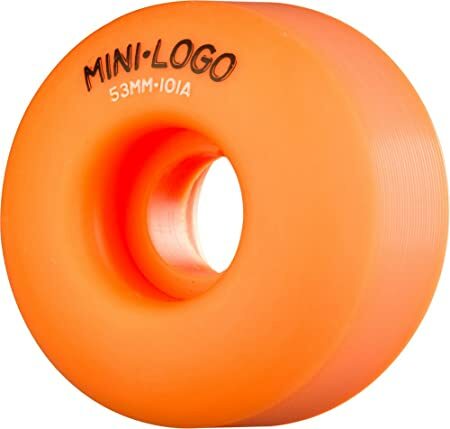 The diameter sizes are ranging between 50 – 56mm, which are average sizes that fit most common skateboard. This helps for those don’t have much access to skateboard gears. Their durometer is super tough with 101a, rarely you would see a company would offer this type of hardness. Yet, they are efficient enough for your practice on a ramp, pool or in a skating park. First of all, let’s discuss what is polyurethane? Let’s not get complicated with scientific terms here. You can perceive Polyurethane or PU for short, is a highly resilient and heat-resistant plastic material. With these two main features, PU is both very competitive and affordable compared to other types of materials. This explains you would see them every day from your car seat, panels, wheels, tires, etc. Other minor features, such as they are widely available and easy to recycle, make PU is the most common materials in many industries. PU can also easily form into many specific measurements, sizes, and shapes. Lastly, this type of plastic is very environment-friendly. It conveniently complies to the manufacturing standards and guidelines. Ok, fine then why use PU for the best skateboard wheels? The main reason is this material consist of a little bit of both worlds. PU still has the flexibility to absorb shocks and impacts when you land. This is why other types of plastic fail and break very early due to the tremendous force. On the other hand, PU also not super hard that cause redundancy and slow speed. This is why your wheels won’t melt after hours of friction caused rolling against the rough surfaces. It also feels very smooth when you slide, cruise or runs over the cracks. So now you know why I call it the best of both worlds. If you are considering the wheels brands, the best selling wheels should be the common choice for both beginners and professionals. These brands have already established its strong foundation in the community for a long time and earned the customers’ trust. 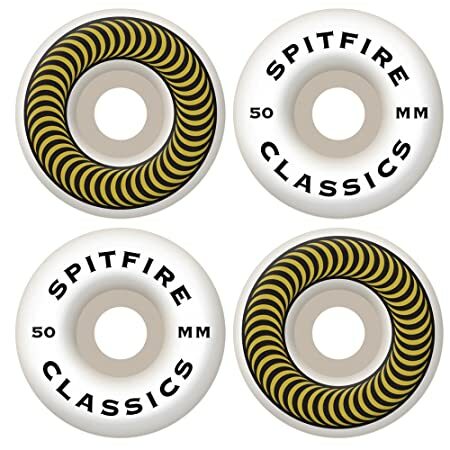 Spitfire – Founded back in 1987 in San Francisco, it is no doubt its long history of existence in the market. Through strong competitions, the brand evolved and refined its products. Till today, it has been well-known with its ultimate skateboard tools and accessories. Mini-Logo – Over a quick period of time, this brand got lots of love from the community. It offers not only the top quality wheels but also other hardware and skateboards. Ricta – Founded more than a decade in 2002. The brand manages to expand its market via the great relationship with distributors. Powell Peralta – Founded by George Powell and Stacy Peralta in 1978, this is one of the oldest brands in the market so far. It thrived through experiences and customer service excellence. 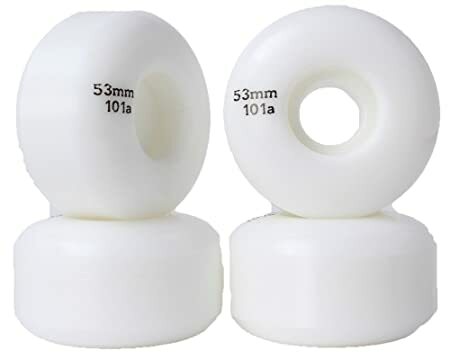 50-53mm: These are small wheels most common for street skateboarders as it fits to do tricks and flips. Easy to skate on smooth surfaces. 54-59mm: These are average wheels size. A well-balanced solution for both doing tricks and daily transportation. The wheels’ durometer, on the other hand, indicates the wheels hardness. This is the key to determine for which purpose you are going to buy them for. The soft wheels perform best on any rugged surfaces. 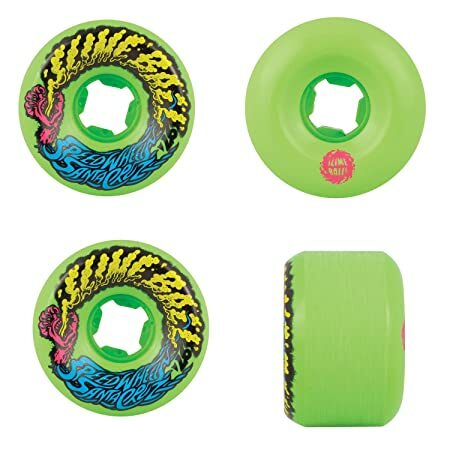 70a – 80a: These are soft wheels, best for cruiser and longboard. Rolling well on rough surfaces such as street, dirt, rocky hills, etc. 81a – 90a: These are in the average scaling, which can use for multiple purposes. However, it won’t give you the best experience of cruising nor the speed for professional competition. 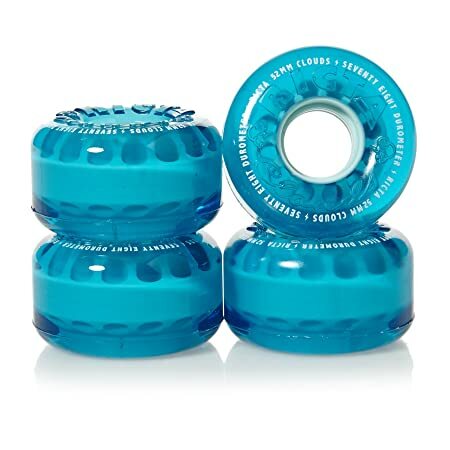 90a+: These are solid wheels, roll very well on smooth surfaces such as ramp, pool and skate park street. They are likely the best pick for many professionals. You would need the look for wheels that are soft and have durometer around 70a-90a. They work well on the concrete cracks and rugged roads. The diameter is likely from 54mm and up, though this has to match with the type of bearings and trucks of your skateboard. The answer is yes but depending on the wheels’ durometer and diameter. Spitfire is currently one of the top brands out there. Yet having a hard wheel (90a+) would ruin the street skating experience. You should try the softer wheels version around 80a to 90a should be fine. Or consult the sale representative to help you pick one.